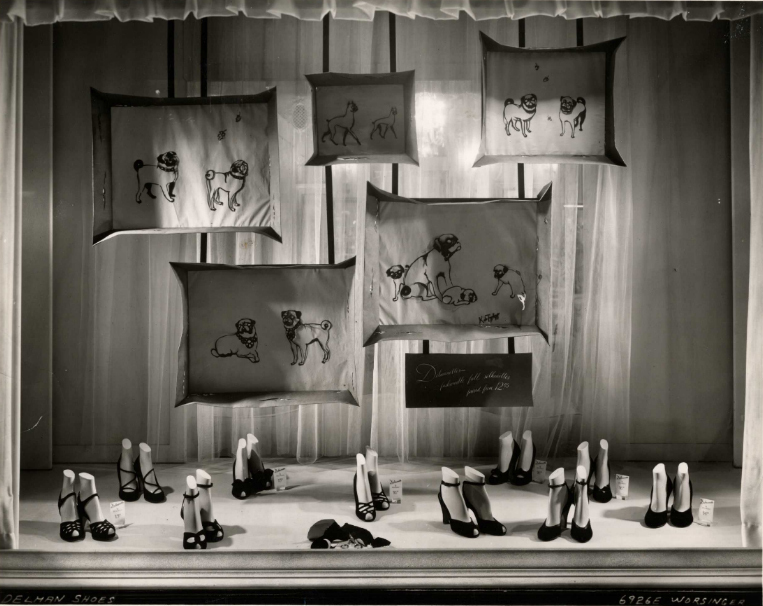 After reading a recent New York Times article about New York City’s holiday window displays, NYSID archivist Nora Reilly was reminded of the window displays of designer Tom Lee, whose archives are housed in the NYSID Archives & Special Collections. Here is some information about him and his work. Chances are good that if you were walking around Midtown somewhere between the years of 1936 and 1959, you encountered Tom Lee’s handiwork. Before hotel interiors, Lee was a well-known designer of window displays for the likes of Bonwit Teller, Bergdorf Goodman, Macy’s, Lever Brothers, R.C.A., and the New York Savings Bank. Lee was also frequently hired to design sets and exhibitions, including sets for the 1940 Broadway production of Louisiana Purchase. Shortly after returning from serving in WWII, he designed the R.C.A. Exhibition Hall. This 1947 exhibition hall, which was the first introduction the general public has to the television and the technology behind it; and it became a popular tourist attraction at Rockefeller Center. See more photographs from Tom Lee’s collection here.